The Cirque of Mafate (700 inhabitants) is located in the center of Reunion island, France (Indian Ocean). Due to its morphological features, this magnificent classified UNESCO World Heritage site cannot be connected to the electric grid and was energised with diesel gensets. 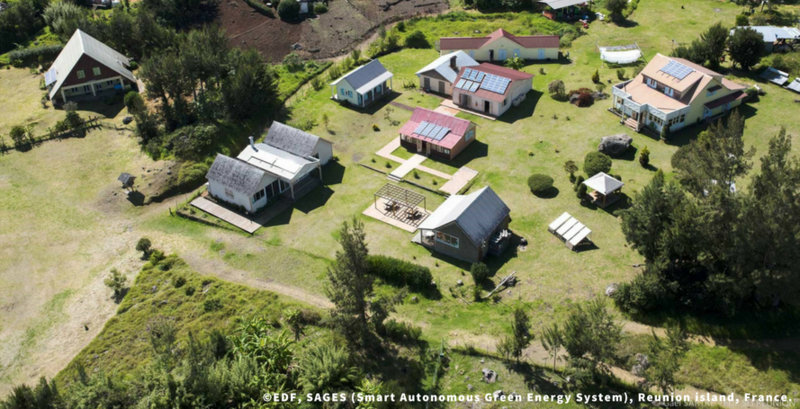 EDF (Electricité de France), with the cooperation of POWIDIAN (a French SME), designed an installation that provides electricity produced by 100% renewable sources. This is achieved by using hydrogen-batteries technology, previously tested in mountain refuges, which provides very long term storage capacity. Called SAGES (Smart Autonomous Green Energy System), this installation is made of photovoltaic panels, lithium-ion batteries assuring a short term energy storage (1 or 2 days), and a whole hydrogen system (with a water electrolyser, a hydrogen storage system and a fuel cell) for long term energy storage (almost 5 days). In order to satisfy the user power demand, first, the power produced by the photovoltaic panels is used. When this power is not sufficient, the complementary part is supplied by the batteries. When their state of charge decreases below 30%, the remaining needed power is produced by the fuel cell, using the stored hydrogen. On the contrary, if the photovoltaic panels produce an excess of power, this excess is used to charge the batteries or to produce hydrogen by the electrolysers. The storage system is currently servicing a school, a medical office and an office of the “Office National des Forêts”. Commissioned in 2017, it successfully guarantees continuous and carbon-free electricity supply since then. The advantages of this technology are many: it allows 100% renewable energy generation, with no pollutants and zero carbon emission, in a landscape where diesel gensets were previously polluting the site. It guarantees security of supply for the inhabitants and especially for public services such as the school and medical office. The economics of this system are also positive, because of the very high supply costs of the fossil fuel previously used in the gensets (due to the specific geographical location of Mafate). Energy storage is one of the key elements of microgrid systems. This is why EDF has developed specific expertise in microgrid systems and several EDF business units are already developing microgrid projects and solutions in various geographies. For instance, in the US, EDF Renewables work to tailor the wide range of microgrid solutions. In a changing energy landscape, EDF is ramping up its efforts to develop electricity storage solutions and become the European leader in this field. Within the framework of its ambitious electricity storage plant, EDF’s goal is to develop 10 GW of additional storage around the world by 2035 (€8 billion investment), on top of the 5 GW already operated by the Group.